Yes, it looks like we have been using the “wrong” kind of cooking oil for the past 6 years at least. No, there isn’t really anything wrong with the oil itself that we use to prepare our food. It’s just that it may not be as healthy as I thought and I only found that out after listening a program on NPR last week on my way home from work. I don’t remember the kinds of cooking oils we used before, but since becoming a Costco member in 2004, we always bought the 2.5-gallon Mazola corn oil for our cooking needs, except once in a while that we got other brands of cooking oils, mostly vegetable oils, from grocery stores when there was a sale. I don’t know why we started using corn oil (maybe because of the price? 2.5 gallons for less than $18 and it usually lasts a long time). All I know is that the corn oil is cholesterol free, which is the only nutritional fact I remember I checked (well, that’s hard to miss because Cholesterol Free is printed in big font and displayed prominently). Other than that, I basically know nothing about corn oil and what it containds and doesn’t. Since we cook our own meal with lots of vegitables and almost don’t eat processed food, I thought our diet is pretty healthy. Thus, I never bothered to learn about cooking oils, until I listened the NPR program. I only listened about 10 minuts of the NPR program, which was talking about omega-6 and omega-3, two fatty acids that are both essential to our health, and the ratio between the two in our diets. From the program, I learned for the first time that the balance between the two fats is actually more important than the amount of intakes. Nowadays, we consume so much omega-6 fatty acid, mostly from processed foods and cookies and cooking oils used to prepare them, that the balance is tilted heavily toward omega-6. Though I am aware of the benefits of omega-3, I never paid any attention to omega-6 and the ratio, which should be around a more healthy level of 2:1 to 4:1. However, the actual ratio from fats we consume everyday is about 10:1 or even 20:1 because we get a lot of omega-6 fats from vegetable oils such as soybean oil, chicken and processed foods. The heavy intake of omega-6 fats isn’t good for our health because the linoleic acid in omega-6 competes with omega-3 when our body converts the α-linoleic acid (ALA) in omega-3 into eicosapentaenoic acid (EPA) and docosahexaenoic acid (DHA), two important nutritional ingredients for brain development (remember those infant formulas that contain EPA/DHA?). This means that the more omega-6 we take, the slower the process our body converts omega-3 ALA into EPA/DHA. When I got home, I did a search on omega-3 cooking oil and found that corn oil, which we have been using for years, is actually a good source of omega-6, the “bad fat”, not omega-3, the “good fat”, because corn oil contains much more polyunsaturated fat than monounsaturated fat. For example, for one serving (14g) of Mazola corn oil, it contains 8g of polyunsaturated fat and 4g of monounsaturated fat. There are scientific studies shown that monounsaturated fat can reduce LDL, the bad cholesterol, and increase HDL, the good cholesterol. 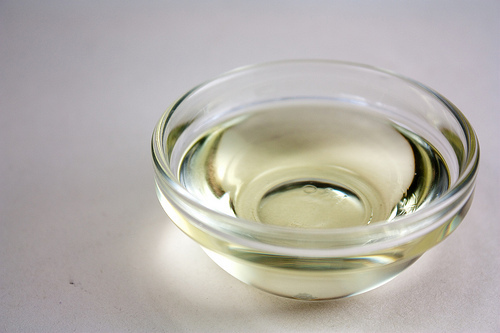 Therefore, cooking oils with high monounsaturated fat content is better than cooking oils with more polyunsaturated fat, which is associated with omega-6 fats.